Focusing on a single form or motif, in his images, Rizzie creates meticulously detailed collage-like environments in which he blends a fastidious attention to detail with a pared-down minimalist approach with which he modifies rather than producing pure abstractions. Rizzie is particularly sensitive to materials and reuses old favorites in his collages and paintings. A serious collector of vintage textiles and linoleums, Rizzie consciously replicates hand screened and blocked effects. The refined shapes of ornamental wrought iron, which he also admires and collects, appear in his paintings. 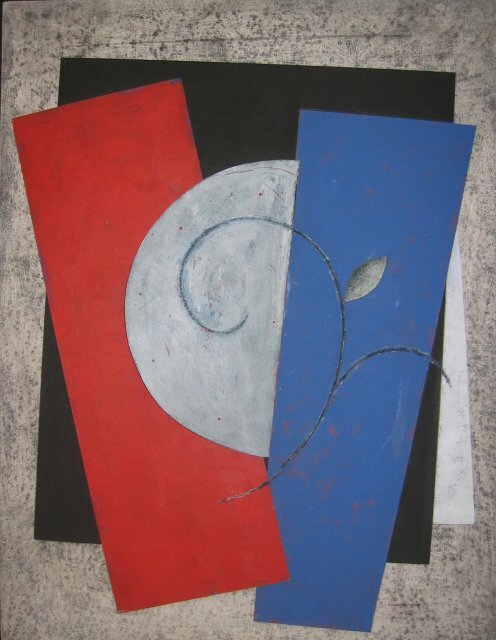 Rizzie's early work was abstract in form and stylistically connected to historical modernism. Over time he refined his visual vocabulary to include cones, circles, triangles, and squares, as well as musical notes or ornamental curves like those found on wrought-iron fences. About 1983, Rizzie began introducing representational imagery such as flowers and vines, tree branches, lettering, teapots and anthropomorphic vessels into his work.